For those of you following the story of my dog Woodrow and his failing health, I have sad news for you. As of today, Friday July 23rd, Woodrow was put to rest from the pain of his seizures. My dog Woodrow died today. Down in the country, they would have said, “Penney’s dog up and died.” He would have been 12 had he lived until January. Woodrow had a good life. He slept indoors. Mostly he ate what I ate. We shared our last meal last night in our living room in front of the television. He was a patient, good-natured dog. Jake has always tried to mess with him and he abided with nary a growl. And oh that face and those eyes. What he could do with that face and those eyes. He would perch himself next to me on the sofa in the living room and look at me. And the love and loyalty would pour out with that look, and as I long as I had that, there was very little that the human race could do to harm my self-esteem. Good dogs don’t love bad people. He was smart. He was fun and he loved to ride in cars. There were times he was all I ever had. And now he has up and died. My own heart, or what is left of it, is breaking. Sending you solace..what a great dog…and a great mom. how lucky Woodrow was to have you with him as long as he did. He brought you great comfort through tough times, hang onto those good memories. all good dogs go to heaven. Penney I’m sorry for your loss, I’m also envious for your gain. Woodrow was more than a dog. He was a soulmate and wonderful friend that gave you exactly what you needed, exactly when you needed it. Even in those times when you felt totally alone, he let you know that wasn’t the case. Yes, you will miss him, but you are also blessed with all those fond memories of his life and what he meant to you. Thanks for sharing your story with me. I hope these words from my favorite writer brought you some comfort. 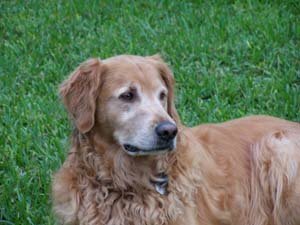 Goldens are such great dogs, they’re like special members of our families.